When it’s time to hit the road, many pet lovers are reluctant to leave their four-legged companions behind. I am owned by two dogs, a Westie and a Yorkie, and it’s hard to enjoy my travels when I’m missing them. But how to fit all their paraphernalia–bowls, bags of food, water dishes, etc.–into the car? The Pet Travel-Tainer is great for long road trips, but also makes treks to the dog park easy. No more letting Sparky lap up scummy water from mud puddles! Just whip out the water dish from the Pet Travel-Tainer and serve. If your doggie is a Fashion Diva, then she’ll appreciate the stylishness of this compact container system. And you’ll appreciate the ease of unpacking your pet’s belongings once you reach your destination. 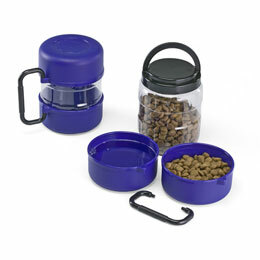 It’s a piece of–well, kibble–to set up your pet’s food and water bowls in your motel room. Maybe you could even train your dog to carry his own Pet Travel-Tainer by the handle? Now that would be a trick worth woofing about!